Here are some facts about the Colorado River. The Colorado River is 1450 miles in length. The river flows through seven U.S. states (including, Colorado, Utah, Arizona, Nevada and California) and two Mexican states. Its source in La Poudre Pass in Rocky Mountains, and it flows into the Sea of Cortez at the Gulf of California, between the Mexican states, Baja California and Sonora. The Colorado River supplies water to more than 25 million people. It is also responsible for irrigating 3.5 million acres of farmland. The Colorado River is home to one of the seven natural wonders of the world, the Grand Canyon. There are eleven U.S. national parks along the Colorado River. The biggest sport along the Colorado River is whitewater rafting. Several sections of the river are used, including Westwater Canyon, Fisher Towers, Cataract Canyon and the Grand Canyon. Most of the major dams along the Colorado River basin were built between 1910 and 1970. One of the most well-known is the Hoover Dam which was built in 1935. The river was nicknamed the River of Law because of all the legal disputes that have involved the flow of the river and its water over the years. It is now one of the most highly controlled rivers in the world. 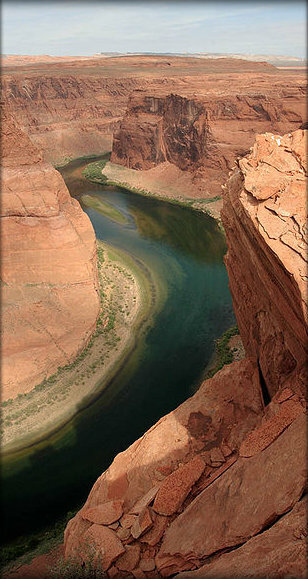 The Colorado River was known as the Red River due to the particles of silt carried in its waters. However, after the Glen Canyon Dam was built in 1963, the colored silt was trapped behind the dam and the river stopped looking red. The Colorado River has an average depth of about 20 feet. Although, it is nearly 100 feet deep in places. The water of the river used to reach 80 degrees F, but due to the dams it is now very cold all year around staying at about 42 degrees F. With the change in temperature many of the fish that once lived in the Colorado River can no longer thrive in the river’s waters. What next? Find out about other famous rivers by visiting our rivers resources page. really good!i got a lot of information for my 3rd grade project. me too!A lot of help! Omg literally thank you so much, I have this huge report on the West Region due in like three days and I looked for simple facts on Wikipedia (stupid decisions…) and this helped me SOOOOOO much!!!!! Whoever wrote this should be proud! helped me on my 5th grade project! This was very helpful for my project on all the different rivers i had to research.